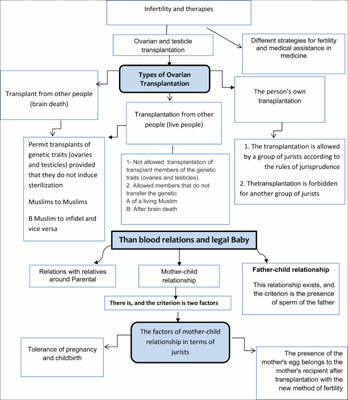 Background: The use of assisted reproductive techniques, in addition to mental and emotional stress in different stages, made some jurists, as fatwa authorities, to investigate and evaluate the problems of this type of transplantation. Objective: The aim of this study was the jurisprudence investigation of the rules and effects of ovarian transplants in women with infertility. Methods: This study was conducted through review and library studies using the keywords ovarian transplants, infertility, jurists’ opinions and religious rules as to ovarian transplantation. Results: Permission for transplanting one’s own ovarian tissue was issued through the consent of most scholars of Islamic schools and according to some verses, traditions, legal rules, and logical reasons. Although some of the Ancient religious scholars have dissenting opinions about transplantation, for some jurists, ovarian transplant from a woman to an infertile woman has no legal problem and the infant belongs to the recipient. However, some other jurists oppose this fatwa. They believe that there is a problem in the oocytes and ovarian transplantation due to mixed parentage and the holy legislator does not agree with this transplantation. So, they had opposing fatwa in this regard. Conclusion: According to the consensus of some Muslim jurists on ovarian transplant from one’s own ovary or from another woman, there is a new hope for infertile couples to use this method which is done from a woman to another woman. Ovarian transplant, infertility, fatwa, muslim jurist authorities, mental and emotional stress, ovarian tissue.